We have talked a lot in this blog about the importance of video in traditional marketing and content marketing strategies. But generally it is common knowledge that video production can be quite expensive. If you have a limited budget but still want to use video in your website (and off-page), one of the best options is to produce talking heads style videos. What is Talking Heads Video? Talking heads video is a video where the subject is talking directly to the audience (camera) or looking slightly off the camera towards an invisible interviewer. Usually only upper body or head of the subject is visible in the video. Why Use Talking Heads Video? Talking heads video is an affordable and relatively easy method of delivering your message to your customers, potential customers, employees or wider public. It also is a great way to show the real person/people behind your brand. In this way you can not only communicate information, but also build trust in your company or organisation. What Aspects Constitute the Cost of Talking Heads Video? In this blog we have several times reminded our readers that there are some components constituting video production costs which almost never change, irrespective of the type of video one is producing. In this particular blog post we will talk about those same components relating to talking heads video production in particular. In most cases the concept of a talking heads video is very simple. Therefore the script writing will in most cases not be an additional cost, as most probably the company/organisation will themselves write down and prepare the message. This is especially true in case of smaller companies/organisations. As regards the storyboards – it is quite clear that in most cases a simple talking heads video will not require storyboards development at all. You will always have to pay for the expertise of a video production team – irrespective of the kind of video you choose to produce. Affordable web video filmed in falking heads style is a relatively simple video, and can be easily produced by a less experienced team. But it is also very easy to create an awful looking talking heads video if the producer doesn’t know what he/she is doing. Is the risk worth it? One of the main components of any video production budget is the length of time spent shooting. As talking heads video in most cases can be shot in couple of hours, the shoot costs are considerably lower than required for more advanced web or promo videos. Next component of any video production cost is the amount of locations where shooting will take place. Traditionally talking heads video is shot in one location, especially if you don’t plan to shoot any cut-away shots as well as if you shoot in a location which does not have to be hired (e.g. your own office). Cut-away shots (shots of environment, the places mentioned in the message etc) certainly make any talking heads video more interesting, but shooting those will most likely mean shooting in more locations and for a longer time. So the costs will be higher as well. If shooting will take place in several locations, travel and accommodation costs also naturally will apply. In talking heads video case we will have to spend relatively small amounts in this category as we usually won’t have to shoot in many locations. Regarding equipment there are two aspects to consider – the level of equipment and the amount of equipment used. Talking heads video can be shot on pro DSLR cameras or even lower level, and can still look good. It is important though to light the video properly in any case. As regards the amount of cameras used – talking heads video can be shot very well on one camera only. This will mean though that the on-camera talent will have to repeat the delivery several times. It is common to use two or more cameras shooting talking heads video from different angles at once, but this setup will increase the overall budget. With regards to talking heads video you will not have to worry about costs relating to on-camera talent too much. In most cases one talking heads video will feature one on-camera talent. This person will in many cases be a representative from your own organisation or company, therefore in many cases there will be no associated fees incurred at all. 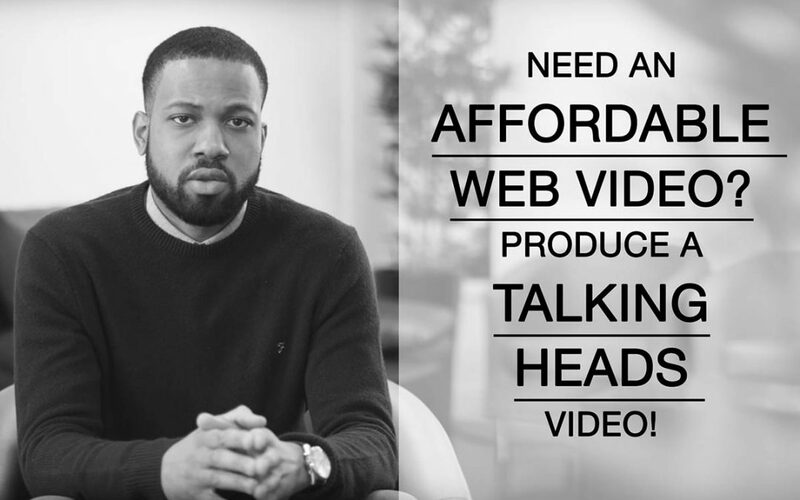 Another way to make your affordable web video even more affordable! Use of special effects and/or animation is a question of concept and taste. It is definitely possible to create very good quality talking heads video by using very limited special effects and/or animation. In many cases simple motion graphics titles will be more than enough. Therefore the costs also will be more affordable than in case of more complex web or promo videos. This aspect of video production cost is also variable. It is certainly possible to produce a quality talking heads video without investing in set, props, wardrobe and make-up at all. But in some cases some clients might want to get a more sophisticated look and produce a video with higher production values even in case of talking heads video. Many video production companies use music that is in the public domain or registered under special creative commons licences. And for talking heads video such tracks in most cases are completely adequate. The more popular is a song/musical piece you choose to use for the video, the more you have to be ready to spend on a licence. And here are some talking heads style videos produced by CineEye – one of the most affordable video production companies in London, UK. The benefit of working with a relatively young company such as CineEye is that you can get a service for an affordable price (we are still only starting to break into the market) and get enough attention from the production team (we still don’t work on multiple projects at a time (this statement is true in November 2017, and we certainly hope things will be more hectic for us in near future). This is especially the case when we work on smaller video projects such as web videos filmed in talking heads style. If you are looking for an affordable web video, look no further – choose to produce a talking heads style video together with CineEye!